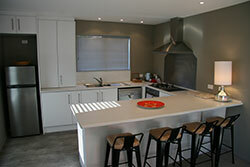 Mapleview Bed and Breakfast - Lake Tekapo. 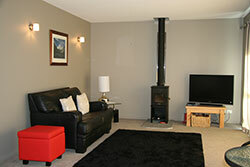 Accommodation with Tekapo Tourism. Mapleview Cottage is a two bedroom house situated at 18C Murray Place. It was recently purchased by Marie and Peter Anderson who have operated the very successful Marie Therese B&B for the past 10 years at 6 Murray Place. Mapleview Cottage is a new house in the older, quieter part of the town, and has the advantage of being only a 7 minute walk to the centre of town, the Church of the Good Shepherd and the Dog Statue. 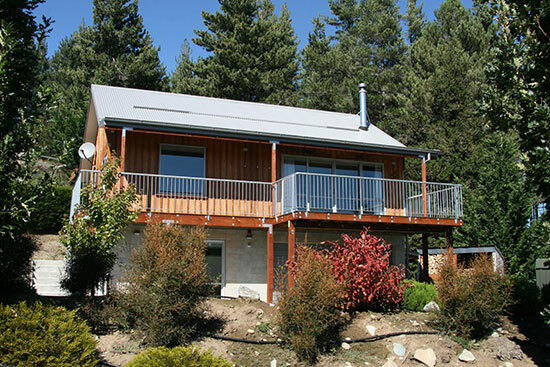 Tranquilly nestled in the shelter of the trees and garden, it has a view of Mt John and in the distance, Mt Sefton. The house was built in 2014 so is very modern and warm. 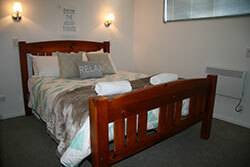 Amenities include: Fully serviced with sheets, towels, down duvets etc, Master bedroom with Queen bed and TV, bedroom with two King Single beds, free WIFI and Freeview TV, spacious lounge with large TV, log-fire, heat-pump and sunny deck, fully equipped kitchen with oven, dishwasher, gas hob, refrigerator, microwave etc. Marie and Peter have purchased this house to help cater for the many people they turn away from their fully booked Marie Therese B&B. We will deliver the same expectation of service and cleanliness and are happy to supply the same Continental Breakfast service to Mapleview by arrangement. Only a 7 minute walk to the centre of town, the Church of the Good Shepherd and the Dog Statue. Tranquilly nestled in the shelter of the trees and garden. The office is at Marie Therese (6 Murray Place – approx 120m away) for check-in, payment and other inquiries. Prices start from $250 for a couple and $25 per extra person per night. Tariff is $275 for 2 persons, $35 per extra person after that.